There has been several changes made for the 2017 Big Dawg World Tour. The major changes are listed in red font within the downloadable PDF. The top 30 skiers from this Big Dawg World Tour ranking list, at the conclusion of the 4th and final tour stop will be invited to the Finals. Please see the official 2017 Big Dawg World Tour Rules and Regulations document below for more information. All events will follow the rules of the local governing body, e.g. USA Water Ski (AWSA) for events within the United States and International Water ski and Wakeboard Federation (IWWF) for international events. All qualifiers and event finals will adhere to the rules as outlined by those governing bodies and this document. All participants will be ranked, pulled, and judged at a max speed of 34 mph. Skiers 35 years and older, who have not placed in the top 10 in the Open Division of a Pro slalom cash prize event in the past five years or any skier age 50 or over. All skiers meeting the eligibility criteria above, are extended an invitation and submit to the tournament registrar an (a) entry form, (b) proof of membership as required per the governing body of the host country and (c) advertised entry fee. Maximum number of skiers is specific to each qualifier. Please see each event page for more details. *Invitation Only Protected Skier Registration Period: From 1/15/17 to 2/15/17, skiers with an IWWF average (as of 12/1/16) of 6 @10.75 (-39’), including unadjusted scores for those skiers who are now age eligible from 36 mph divisions, are invited to register. Note: A skier who meets these criteria but does not submit registration during this period will not be protected during the Open Registration period. The list of protected skiers can be found on nautiquebigdawg.com. *Open Registration Period: From 2/15/17 onwards, any skier who meets the age and professional status qualification may submit registration. Once all slots are filled, remaining entries submitted will be put on a waiting list. Please refer to nautiquebigdawg.com for more information on registration and entry procedure for each qualifier and finals, as it may be different for individual events. *PLEASE NOTE: Entries can be sent in at any time via the preferred method designated by each host (electronic or paper). Non-protected entries will be prioritized after February 16th, 2017 based on postmark or electronic time stamp. A points system based on placement at each event will be used to determine qualified athletes for the Finals. The winner of each event will be awarded the maximum of 45 points and will receive an automatic invite to the Big Dawg World Tour Finals. Skiers finishing 2nd-45th place will receive points based on the chart below. A cumulative score for each skier will be calculated by adding the two highest point totals from the qualifying events. The top 30 skiers will be invited to compete at the Big Dawg World Tour Finals. Ties will be broken by the highest score (ex. 4.5 @ 39 off) of any round of any Big Dawg qualifying event. Second level tie breaks will go to the next highest score from any qualifying event. Alternates will be selected in order of the overall Big Dawg World Tour Ranking List. Qualifiers: Seeding will be based on the current IWWF ranking score. Qualification Round 2 seeding will be the same running order as Round 1. Finals: Seeding will be based on the 2017 NBDWT Overall Ranking List. If there is a tie between skiers for single highest score then the higher placement goes to the next highest score from any event or round in the Big Dawg World Tour. Any ties remaining after all scores are used will be broken by the current IWWF ranking list. Round 2 seeding will be the same running order as Round 1. Head-to-Head Seeds 1-8 will be based upon best single score from any of the qualifying rounds. Ties will be broken by using skiers score from second round of qualifying (e.g. back-up score from skiing in the qualifying event). If a tie still exists, the initial seeding placement from that event will be used. Head-to-Head Seeds 9-16 will be based upon cumulative score of both qualifying rounds. In the case of a tie on cumulative score, ties will be broken using the skier’s best score from qualifying rounds. If a tie exists for any spot other than 16th, second-level ties will be broken using the skier’s USA Water Ski National Rankings List score or equivalent IWWF average (non-US skiers). If a tie for the 16th spot exists after the first- level tiebreak criteria (e.g. best score from qualifying rounds), a run-off will be held to determine the 16th slot. If run-off consists of multiple skiers, the skiing order will be determined by the running order at the time of the tournament start. 17th place and below will be based upon best single score from any of the qualifying rounds. Ties will be broken by using skiers score from second round of qualifying, unless first round scores are only available scores. (E.g. back-up score from skiing in the qualifying event). If a tie still exists, the initial seeding placement from that event will be used. The 3rd and 4th place will be determined by the best score (of the two losing skiers) in the Final 4. The 5th through 8th place will be determined by best single score in the round of 8. Any tie for placement, will be broken using back-up score from the round of 16. If for any reason a skier is unable to finish both rounds of initial qualifying rounds, that skier will receive points based on the first successful completed round. 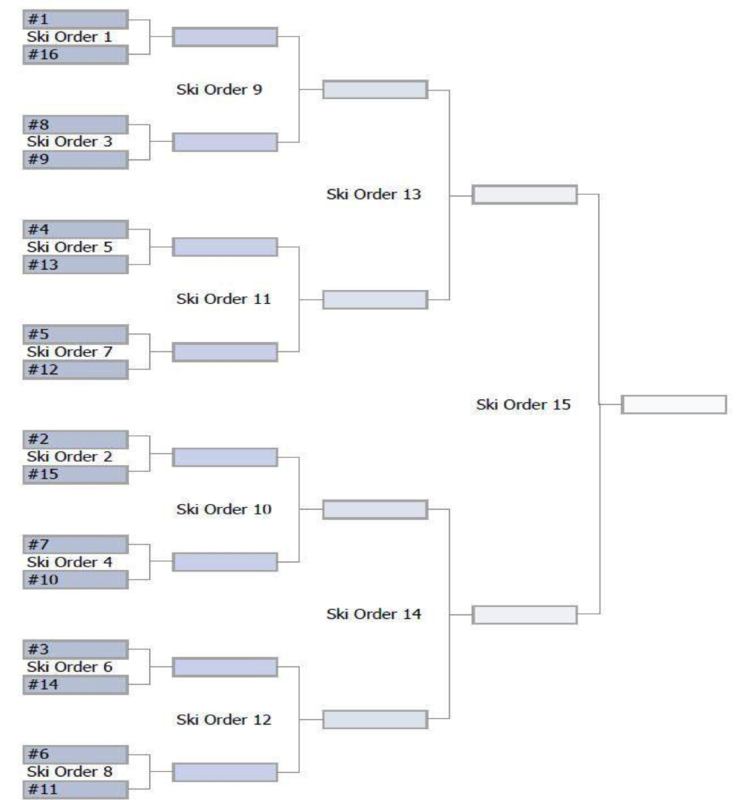 If for any reason a skier is unable to compete in the first round of the Sweet 16 head to head, that skier will receive 16th place points and all skiers below will move up to fill his spot in the Sweet 16 bracket. The 16th spot will be filled with the athlete with the highest average score from the qualifying rounds. During the head-to-head Sweet 16 competition, if one of the skiers cannot continue due to injury, the next highest scoring non-winner in that bracket will move into the next bracket to take his place. Example: If seed #3 wins his pairing in the Elite 8, but is hurt in the process and cannot continue, the next non-winning skier with the highest score in the Elite 8, will take the injured skier’s place and move into the next bracket (Final 4 in this case). If ties exist when identifying the next highest scoring non-winner, the tie will be broken by taking the highest score from the preceding round (Sweet 16 score in this case). If injury comes during the initial Sweet 16 round and a tie for the highest non-winner skier exists, the tie will be broken based upon Sweet 16 seeding. Tournament Delays: If for some reason (weather, tech, or other) it is not possible to complete the second preliminary round in the same day; the Sweet 16 will be based upon the best single score from the first preliminary round. This will be determined by chief judge based on weather forecasts. In the event of a head-to-head round that has started and becomes delayed, the previous head-to-head round scores will be used to determine winners, if unable to finish. Tournament will not be pushed into another day. Minimum rope length or maximum number of passes will be determined by the chief judge. Top 4 scores will advance to head-to-head Final 4. If a tie exists in places 4-16, to determine final 4th spot, the best score in qualifying rounds will be used. If a tie exists in cash payout positions (5-8), skiers will share the payout. If Sweet 16 is unable to be run, prize money will be based on 2nd round scores, if 2nd round scores are unavailable 1st round scores will determine winners and prize purse. After Sweet 16 has been completed prize money will be based on Sweet 16 scores. After Elite 8 has been completed prize money will be based on Elite 8 scores. After Final 4 has been completed prize money will be based on Final 4 scores.